Update: Scroll down for the chant on You Tube. 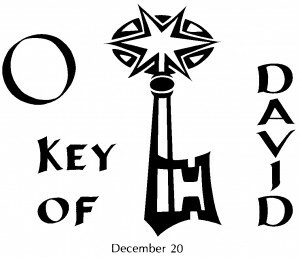 O Clavis David (December 20) O Key of David (Apoc 3: 7) Scepter of the house of Israel, you open and no man closes; you close and no man opens (Isa 22: 22). Come, and deliver him from the chains of prison who sits in darkness and in the shadow of death (Ps 107: 10). The key is the emblem of authority and power. Christ is the Key of the House of David who opens to us the full meaning of the scriptural prophecies, and reopens for all mankind the gate of Heaven. Christ frees us from the prison of sin.